If I could describe Dawn with one word, it would be “thoughtful.” She doesn’t waste time getting things done, but she definitely approaches everything she does with sincere thoughtfulness. It’s how she runs her business, Whitestone Professionals, LLC, and it’s how she handles her auto repair decisions. After spending time with Dawn, I’ve been able to bring insight and direction to the shop that has increased efficiency in customer interactions, administrative work, as well as how the shop functions. It’s so neat that Dawn gets to experience the improvement to our business first-hand whenever she brings us her 2007 Toyota Prius. “My whole family has loved this car, so I’m not anxious to part with it,” Dawn shares. After a sudden death in the family, there was a swapping around of vehicles and Dawn ended up with her parent’s year-old Prius. It was the first time her parents had bought a brand-new vehicle and, as a middle school science teacher, her dad was excited to have an environmentally friendly car. After 10 years of driving it, she’s seen that not only is the gas mileage and comfortable ride ideal for the vast amounts of driving she does with two active teenage daughters and a business that keeps her on the go. Even more miles are added when her thoughtfulness leads her to do favors for those around her (present company included! ), so you’d better believe she spends a lot of time in her car. In fact the only thing she doesn’t like about it is how it handles in the rain because of the heavy battery in the back-end. No wonder Dawn wants to keep her Prius for as long as possible! That’s exactly what attracted her to us. “Marinelli Auto Service wants to help people to be good stewards of their cars. I love that concept!” she exclaimed to me. 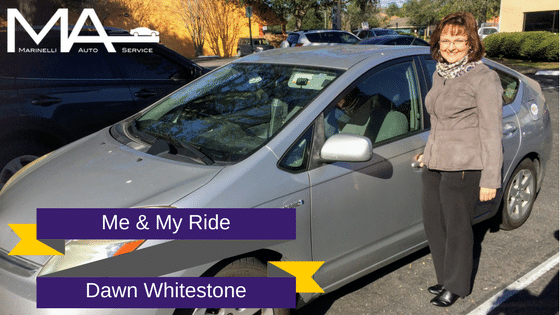 Dawn doesn’t like debt, and she never wants to have a car loan ever again, so she’s diligently saving for her next car while she continues to invest in her Prius to keep it running well and we’re glad to help. We can tell when customers, like Dawn, have come to trusting us because when she brings us her car, she doesn’t require a lot of detail. Dawn thoughtfully takes into consideration Andrew’s expert evaluation and advice and she just says, “fix it.” We’re thankful that we have her trust and to see her drive away happy.